The BAY AREA STEAMPUNK SOCIETY BOOK CLUB will discuss the latest installment in the Discworld series, Raising Steam by Terry Pratchett. Join Alexander and Bosco the third Sunday of each month at 2pm as they discuss Post Apocalyptic Fiction. This month we'll be meeting on APRIL 27TH and continue the discussion of Good Omens by Neil Gaiman & Terry Pratchett. 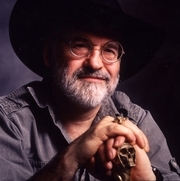 We'll be discussing the Printz Honor Winner by Terry Pratchett, Dodger, March 28 @ 7:00. A storm. Rain-lashed city streets. A flash of lightning. A scruffy lad sees a girl leap desperately from a horse-drawn carriage in a vain attempt to escape her captors. Can the lad stand by and let her be caught again? Of course not, because he's . . . Dodger. Terry Pratchett , Making Money. TERRY PRATCHETT, WYRD SISTERS (play). Terry Pratchett's book Snuff was available from LibraryThing Early Reviewers. Terry Pratchett is currently considered a "single author." If one or more works are by a distinct, homonymous authors, go ahead and split the author. Terry Pratchett is composed of 34 names. You can examine and separate out names.